This self-guided trip takes you from the beautiful mountains, valleys and rivers of the Picos to the quiet beaches of the Bay of Biscay. Hike among the gorges and limestone peaks of the magnificent Picos Mountains, along stunning coastline and relax on unspoilt beaches. Your trip starts in Arenas de Cabrales, one of the northern gateways to the Picos de Europa. This small sleepy town lies in the shadows of these attractive limestone mountains and often plays host to walkers keen to explore. Due to their proximity to the sea and relatively low elevation the 'Picos' have a mild climate in summer, and ideal terrain for interesting walking - With great views and interesting flora and fauna. Today starts with a short, pre-booked taxi ride to Ortiguero. From here you follow the old 'Royal Footpath' along the slopes of the Sierra de Cuera through old chestnut woods and by small streams, and are rewarded with great views of the Picos de Europa. Half way through the walk you arrive to the village of Asiego, where you can try a typical 'espicha' lunch made up of small portions of local delicacies. On returning to Arenas de Cabrales you may wish to visit the cheese museum, the local natural caves or relax in a café or bar. Today's walk is almost 12 kilometres and takes approximately four and a half hours. The total ascent and descent is +310m / -600m. The route today takes you along the Cares Gorge, through spectacular scenery, on one of the most famous routes in Spain. The path was originally a maintenance path for the Canal del Cares, carved through the mountains at the start of the 20th century to supply a hydro-electric power station. However today many walkers take this route to follow the Cares River through this deep, impressive gorge that divides the western and central massifs of the Picos, returning the same way. This walk starts and ends in nearby Poncebos. A pre-booked taxi will take you there and pick you up at the end of the day. The walk today is 23 kilometres and takes approximately six and a half hours. The total ascent and descent is +600m / -600m. The walk today starts and ends at the hotel. Taking you out of the town the route takes you through quiet woods and meadows in the shadows of the Picos. Half way into the walk you reach the small village of Poo de Cabrales which has a cosy bar where you may decide to stop for a while. Similarly on your return to Arenas de Cabrales there are small cafes and bars to relax in. Today's walk is nine and a half kilometres and takes approximately three and a half hours. The total ascent and descent is +/- 420m. Lying between the Picos de Europa and the Atlantic coast is another small mountain range called Sierra de Cuera. Today's route follows a high path from west to east along this range, through the unspoilt, rural valley of Llabres, arriving to the coastal village of Poo de Llanes. The day starts with a pre-booked taxi transfer Turanzas. Although close to the coast Poo de Llanes has kept its traditional village feel, with mainly Spanish families visiting during the summer. It has a few restaurants to choose from in the evenings, two of them on the beach ten minutes walk from the hotel. 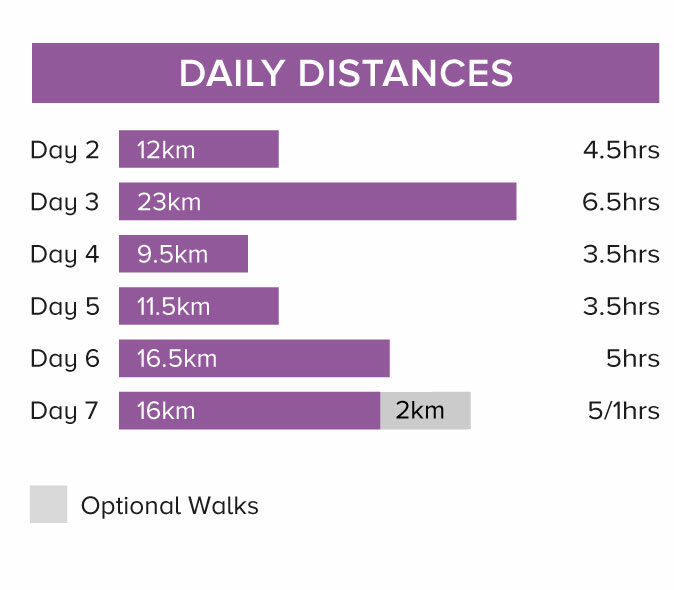 The walk today is 11.5 kilometres and takes approximately three and a half hours. The total ascent and descent is +110m / -130m. This morning starts with a short pre-booked taxi transfer to Vidiago, from where the route follows the coastal footpath back to Poo de Llanes. This lovely walk takes you along limestone cliffs, through small villages and past unspoilt beaches and coves. Before reaching Poo de Llanes the route takes you through the medieval town of Llanes. You may wish to spend some time here exploring the old town, and waterfront, or relaxing in a local café before continuing on to Poo de Llanes. Today's walk is 16.5 kilometres and takes approximately five hours. The total ascent and descent is +285m / -300m. 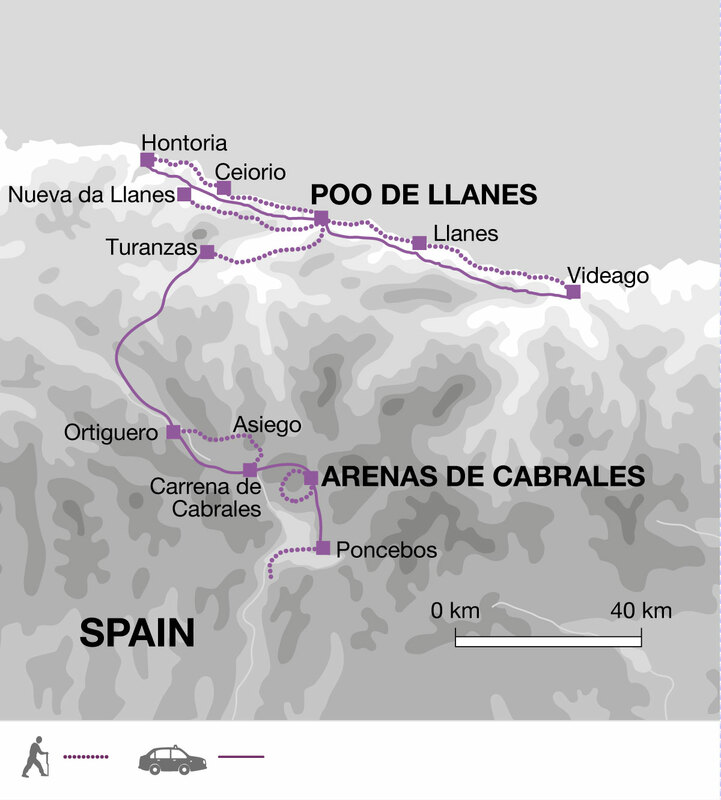 Today the route starts at the hotel, walking from Poo de Llanes along the beautiful cliff tops to Celorio. It then joins part of the Camino del Norte (one of several pilgrim routes that end in Santiago de Compostela) to San Antolin, where, during the summer, there are a couple of bars and the opportunity to swim. From here you can either continue along the coastal path to Hontoria or turn inland continuing on the Camino del Norte to Nueva. From Hontoria or Nueva you catch a train back to Poo de Llanes (not included). The walk to Hontoria is 18 kilometres and takes approximately six hours. The shorter walk to Nueva is 16 kilometres and takes approximately five hours. The total ascent and descent is approximately the same at +275m / -275m. From the central bus station in Santander, take a bus to Unquera. There are 5 departures per day between 08.30 and 19.30, operated by ALSA bus company. Tickets can be purchased upstairs, in the entrance hall. The journey takes between 1hr 20min and 1hr 40min. The cost is approx. 6.50€. Please check timetables, prices and estimated travel time at www.alsa.es. We recommend booking your bus tickets in advance. From Unquera bus station you will need to take a taxi to Arenas de Cabrales which costs approx. 45€. This can be pre-booked if booked at least two weeks prior to departure. There are also direct bus services from Santander airport to Llanes, with departures at 12.05, 15.10 and 16.50. But you have to book them in advance via www.alsa.es, booking your ticket from "Aeropuerto Santander". Travel time is approx. 2 hrs. From Llanes bus station you will need to take a taxi to Arenas de Cabrales which costs approx. 45€. This can be pre-booked if booked at least two weeks prior to departure. Take the shuttle bus from the airport to Bilbao bus station in the city centre (Termibus). These go every 30 mins. between 6.15 and 23.15. The cost is approx. 1.50€. You can also catch a taxi to the city centre for approx. 25 - 30€. From Bilbao bus station (Termibus), take a bus to Unquera OR Llanes. Tickets can be purchased from the ALSA bus company ticket window (ventanillas - no.s. 3, 4, 5 and 6). The journey takes about 3 hours to either Unquera or Llanes. From Llanes or Unquera bus station you will need to take a taxi to Arenas de Cabrales which costs approx. 45€. This can be pre-booked if booked at least two weeks prior to departure. All public transport times and prices are subject to change, please check exact details for your dates of travel prior to arrival. Mon 15 Apr 2019 - Mon 24 Jun 2019 Your trip can depart anytime between the above dates. Contact us for triple room requests and solo traveller prices. Tue 25 Jun 2019 - Wed 10 Jul 2019 Your trip can depart anytime between the above dates. Contact us for triple room requests and solo traveller prices. Thu 11 Jul 2019 - Fri 19 Jul 2019 Your trip can depart anytime between the above dates. Contact us for triple room requests and solo traveller prices. Sat 20 Jul 2019 - Tue 3 Sep 2019 Your trip can depart anytime between the above dates. Contact us for triple room requests and solo traveller prices. Wed 4 Sep 2019 - Sat 14 Sep 2019 Your trip can depart anytime between the above dates. Contact us for triple room requests and solo traveller prices. Wed 15 Apr 2020 - Wed 24 Jun 2020 Your trip can depart anytime between the above dates. Contact us for triple room requests and solo traveller prices. Thu 25 Jun 2020 - Thu 9 Jul 2020 Your trip can depart anytime between the above dates. Contact us for triple room requests and solo traveller prices. Fri 10 Jul 2020 - Sat 5 Sep 2020 Your trip can depart anytime between the above dates. Contact us for triple room requests and solo traveller prices. Sun 6 Sep 2020 - Mon 14 Sep 2020 Your trip can depart anytime between the above dates. Contact us for triple room requests and solo traveller prices. Tue 15 Sep 2020 - Sun 25 Oct 2020 Your trip can depart anytime between the above dates. Contact us for triple room requests and solo traveller prices.